Rescue efforts are under way in the northern Philippines as authorities have raised the death toll of Typhoon Mangkhut to 65. 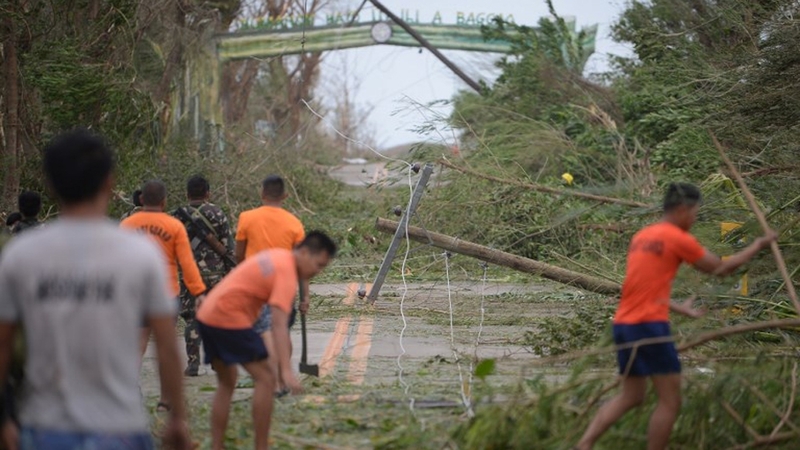 Philippines National Police said that as of Monday, a further 43 people remained missing and 64 were wounded as a result of the world’s strongest storm of this year. Philippine police earlier said that at least 40 people, the majority of who are gold miners, were feared to have been trapped when part of a mountain slope collapsed on miners’ barracks in a remote village of Itogon town in Benguet province. Seven bodies were dug out there on Sunday with rescue work resuming on Monday morning. Reporting from Itogon, Al Jazeera’s Jamela Alindogan said the mayor has said he fears the death toll could rise. “There have been reports that there are pockets of landslides in different parts of this village and we were told that the entire devastation in this community has not yet been grasped,” she said. Homes and farmlands were left destroyed in rural communities in Luzon’s northeastern Cagayan province, where the typhoon first came to shore. “There is significant destruction of property and root crops,” General Emmanuel Salamat of the Philippine Marines told Al Jazeera. “It really hurts us, we don’t know where to begin,” she said. “Our house was blown away. We were flooded,” 55-year-old Diday Llorente told the AFP news agency.